Do you measure success in dollars and cents? So whoever has the most money wins! Many people admire the rich, because we want to be one of them. Don’t you? Of course you do, it certainly is one measure of success. What does success mean to you? Success is a lot of things. How do we measure success in school? Is it always the highest grade? I guess this is when I say success can be open to interpretation. Success for the average student can be less than the highest grade. If the average child does his/her best and only achieves a B, isn’t that success? I think so and money does not even enter into it! Can a parent be successful and poor? Yes! They can be successful parents, if they are good parents! How do you measure this? They are raising healthy, well adjusted, respectful and successful children. Most importantly, they would be breaking the poverty cycle. The young person graduates from high school, trade school or maybe college, how do they know if they are successful? Graduation is the goal and achieving that goal was achieved. They are successful! Achieving a goal fits the definition of success. They start a career working in a restaurant, as an apprentice electrician, or accountant. If these are career choices rather jobs and this leading to a career position, they are successful. Did you notice no money measurement entered into this evaluation. One definition of success is the favorable outcome of something attempted. This is less subjective than originally stated and broadens the definition. 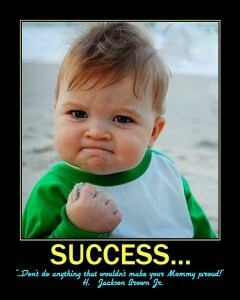 Success is also defined as the attainment of wealth, fame, etc. You cannot avoid it! Most of us see wealth and naturally call that person successful. How much wealth defines success? If the attempted goal is to amass a billion dollars and you fell short by half, are you successful? No, but I would be okay with that level of failing as long as it was profitable. Even successful people are not successful every time they attempt a goal. If you want to be a successful actor, do you have to be a star? Is it okay to be second rate, never center stage or a star, but work all the time and attain wealth? Success is different from wealth! Can you be successful without monetary wealth? There are many careers where success is not rewarded by wealth. Some of those careers may be teachers, church leaders, police officers, fire fighters, social workers, and many fine artists. Measurement of success in these careers will not probably include wealth. Some may feel a successful artist would be measured by wealth, however artists are judged by art critics based on their work. In fact, wealthy church leaders may be under suspicion as to their motivation. Success is more than wealth! Can you be successful and only achieve a middle class lifestyle. Yes, if the goal is attained. There is Certified Public Accountants (CPA), and Attorneys who do not make partner at their firms. Are they failures and unsuccessful? Some would say yes! These people end up leading Fortune 500 companies as Chief Financial Officers and Chief Executive Officers. In most instances, they become very wealthy. Success usually follows failure, but not always. Success means different things to different people, but the best definition is an attainment of a goal. Can you be happy, successful, and not wealthy? Absolutely! There are lot of entrepreneurs who will never be wealthy, but they have what they want from their career. It may be independence, control of their future, following their dream, time to enjoy life, and feeling worthwhile. Earning enough money is certainly part of success, but not necessarily wealth. I tried to discuss enough different careers and circumstances to expose what success is in different circumstances. If success is measured by wealth, how much is wealthy? How do you measure wealth? Is one (1) million dollars or ten (10) million dollars defined as wealth? I could be a successful school superintendent making a modest $250K and running a high performing school district. Isn’t that success? Yes, but hardly wealthy! I hope I expanded your view of success. What do you think? I used to equate success with wealth. However, as I have gotten older and have been exposed to more people, I have realized that money does not always buy happiness. I now equate success with happiness, regardless of economic status. If someone I know lives in a 800 sq ft bungalow but has a happy family, then I view them as successful. It took me a while to realize the very same thought! Good for you. Success mean different thing to everyone. Success for me would be a comfortable lifestyle and a happy family. We need to figure out what is really important to us and spend money there. Frivolous spending does not equate success to me. Remember, success is the achievement of any goal. I agree with everyday tips and RB40.. success is different for everyone. I think it’s a very individual and personalized thing- some may view being filthy rich as successful, whereas others would view having a family without ending up in divorce success. Success is achieving a goal. It is really as simple as that. Yep success is all how you view it. How you want to create it for yourself. For me personally it is a combination of financial wealth and contentment. Though really the contentment part is the most important. You can have contentment without financial success, but having financial wealth without being happy is not a fun life to live. Where people (including myself in the past) go wrong is making them mutually exclusive, that you can only have one or the other. You can have both and should…if you want it that way. Success can be subjective, but it is really just achieving a goal. The goal can be one million dollars net worth or achieving a certain weight. Yes it can be anything you want it to be. That works since success is achieving any goal! Success can be trivial such as losing 5 pounds or accumulating a million dollars. Both would be considered a success! Between my husband and me, we have different view of what success is. So I guess it totally depends on the individual. My measure of success is more material than his. But both of it comes down to what makes us happy. For me a comfortable life (reasonable) makes me happy, for him, he will be happy if we can giveaway 90% of our income and live with 10%. That is what he is working towards. As long as someone is happy with what they have/accomplished, they are successful in my opinion. Success can be subjective, however it is achieving a goal. It can be giving away X dollars or losing 5 pounds.